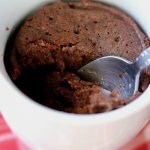 This Keto Chocolate Mug Cake will totally satisfy your sweet tooth and is ready in 2 minutes! Add butter and coconut oil to a microwave-safe mug. Heat on high for 20-30 seconds until almost melted. Stir until there are no solid lumps. Add dry ingredients and egg and whisk until everything is incorporated. Return mug to microwave and cook for 90 seconds.